Thrips are a type of invisible plague to roses and many other ornamental and even fruit and vegetable plants! 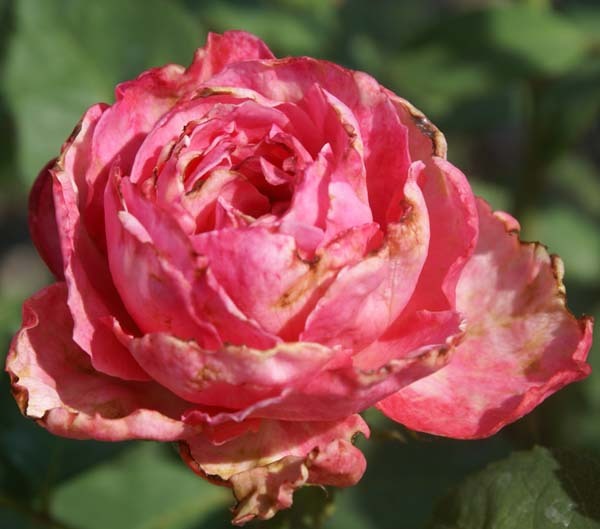 They can be tough customers to get rid of once they have invaded your roses – but with the right advice and by spraying with effective insecticides it can be done. Visible damage to the the petal edges. To control thrips, it is essential to add an insecticide to every spray cocktail, and to spray thoroughly in order to make good contact with the larvae or insect. The smell of garlic contained in Ludwig’s Insect Spray is a deterrent to thrips. Remedy: Apply Koinor as a drench in September. Watch this video on how to apply Koinor. Alternate with including Cyper and Plant Care into your spray cocktails. It is important to spray thoroughly in order to make good contact with the larvae and insect on the leaves and in the blooms. The smell of garlic contained in Ludwig’s Insect Spray which is the main ingredient of our main Cocktail is a deterrent to thrips. 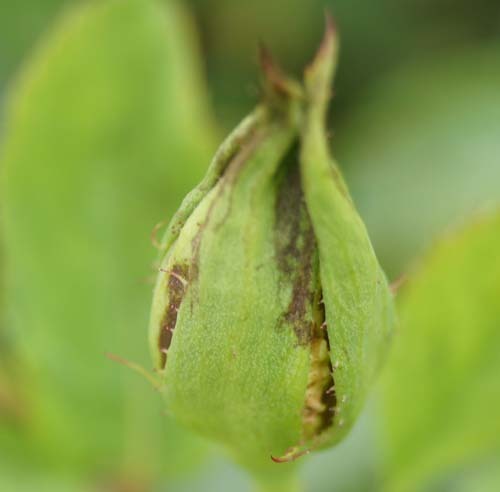 However if you see the damage to your roses you need to include the above named insecticides into the mix. Frequency: Weekly over three weeks if you can see visible damage. A regular spray program preventatively keeps thrips at bay. Effect on plant: Damage to bloom as petals take on an ugly appearance as the chew marks and scars become pronounced when the petals unfold. Damage to young growth so that leaves clearly looked deformed and shrivelled up. 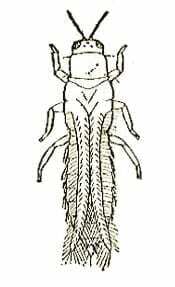 Info: Thrips are tiny, winged insects that settle between the petals of tight buds and start rasping the petal edges. They can damage the petals of each bloom on the plant. 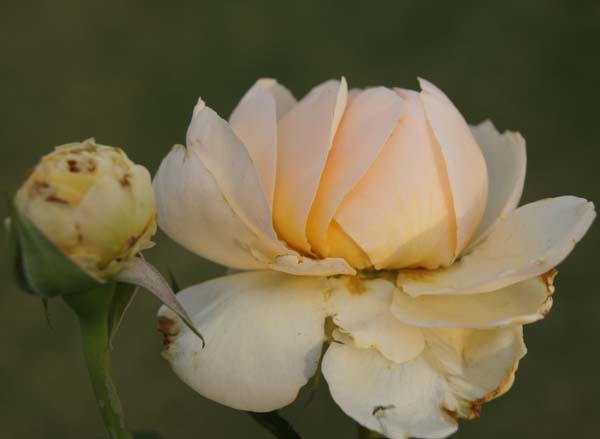 The damage is more visible on lighter coloured roses. 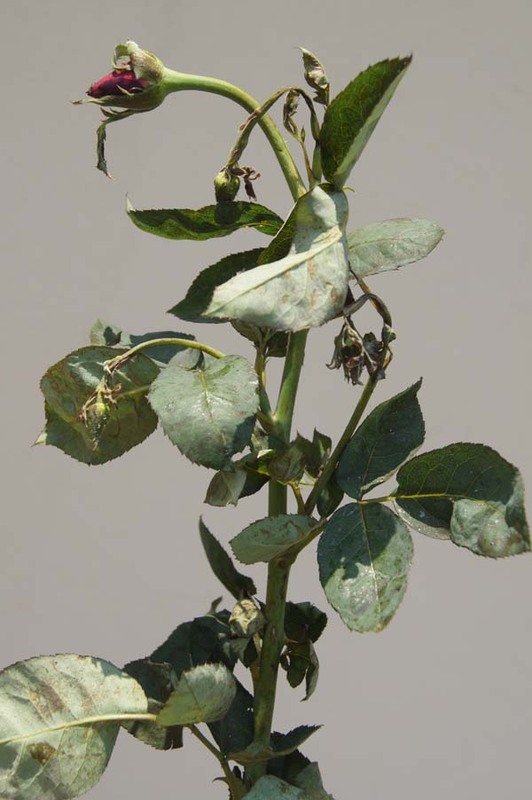 Serious damage includes the deformation of young leaves and growth. The breeding cycle stretches from eggs that develop in the soil, through two larval stages on the leaves, to the mature insect in the flower. They are able to fly and are easily carried by the wind. 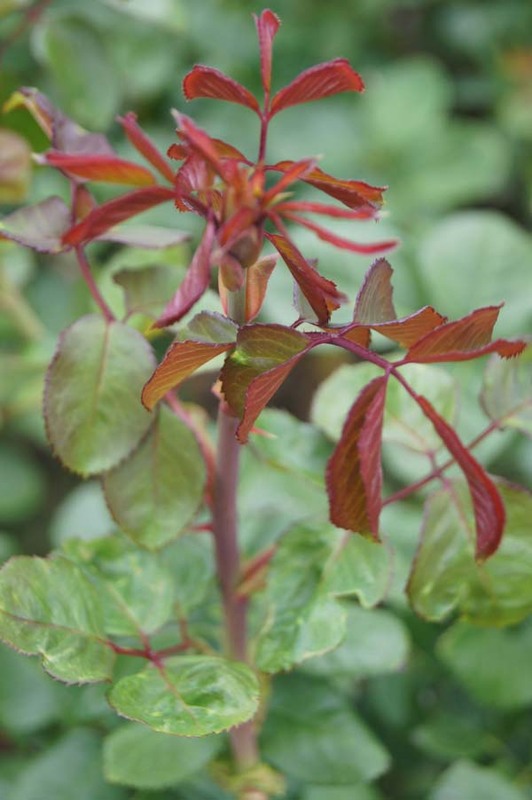 Other plants and weeds may act as host plants from which they easily fly or blow into your roses. Roses are one of their delicacies. You can imagine them to be to plants what mosquitos are to humans. If no action is taken: Blooms look “ugly” and leaves may look deformed. Rose does not perform as it should. This blemish was caused by thrips before the sepals opened. Thrips damage on the yet to open bud. Thrips damage to bud and within the bloom. Thrips punctured the very immature leaves causing curling. Thrips damage severe and unchecked! They chew away on both sides of the leaves. The marks seen are scar formation. After spraying the new leaves are free of any thrips damage. As a language person I’m entertained by the fact that the singular and plural forms of the word ‘thrips’ are the same: one thrips, two or more thrips! There can’t be many words like that in the English language. As interesting as that may be, it’s irrelevant to what happens in the garden. Some of our members have phoned me recently (I’m writing this in mid September) and asking me to tell them why the new foliage on their rose bushes is gnarled. (Telephonic diagnoses are hit and miss affairs. I’d rather avoid them.) I myself have a bad infestation of thrips in my own garden, and stupidly failed to make a connection between what’s happening in my garden and what might be happening in our members’ gardens. Sorry! It’s possible that you may have thrips too. If in your garden you find a gnarled young bloom with brownish blotches on the petals, snap it off the cane, take it inside the house, turn it upside down over a bright surface such as a sheet of white paper, ands give it a smart rap. If you’ve got thrips they will fall out of the bloom onto the paper, where you will see a number of minute elongated winged insects walking about aimlessly. Thrips! This is a diagram of the Western Flower Thrips, which is the variety we’re likely to have in our gardens. There are actually about 6000 different sorts of thrips in the world, but this is the one that particularly likes roses. Of course, this is a huge magnification. The actual insects are no more than 1mm or 2 mm in length. The females are amber or yellowish-brown to dark brown in colour, and the males are a bit smaller and are light yellow. Both genders have serated wings and piercing mouths. They feed on pollen and on the sap of petals, which they extract by sucking or by vibrating their wings in between the closely compressed petals, thus damaging them and causing them to exude sap. 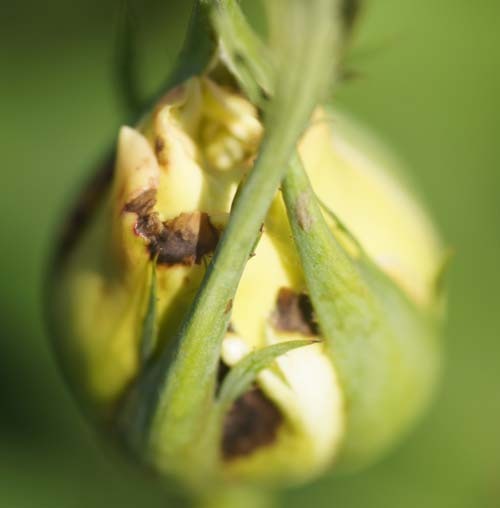 This causes the brown blotches on the blooms. 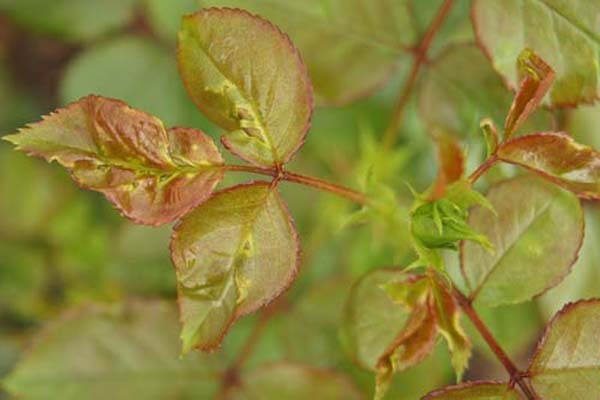 They also feed on young foliage, slashing the surface and sucking the contents of the cells, distorting the growth as the leaf tissue expands, and causing the plant to produce blind shoots rather than buds. Damaged leaves may be puckered and twisted. Females insert eggs into succulent host plant tissue, the eggs develop into two successive larval stages, then into pupae, and then into adults. The process takes about 13 days in ordinary weather. (It’s faster in hotter weather and slower in colder weather.) Adults live about 28 days and lay an average of 44 eggs! Some of the literature advises that you plant garlic among your rose bushes or spray with a garlic-impregnated oil for various reasons including the possibility that it will disguise the perfume of the roses and so keep the various insect pests from finding them. I don’t know if that works or not but it’s certainly not going to help if you already have an infestation. I’ve had no success whatsoever in my attempts to get rid of my thrips, and as I write this I’m worrying about whether or not I’ll have any blooms to exhibit at our Spring Show. The reasons why thrips are virtually impossible to get rid of are because their lurking places in between the petals of tight flower or leaf buds shelter them from contact insecticides, because they’re immune to many systemic insecticides, and because they build up immunity to contact insecticides rather quickly. But even if we can’t get rid of them altogether, we may be able to control them successfully. We may or may not! I’ve tried just about everything that one is advised to do, without success, and now I’m going to have to try again, but as always with a slight difference. Reading most of the literature on the web and everything my books say about this topic, I think the thing to do may be to try to interrupt the life cycle of the insects (as one has to do with white-fly and red spider-mite). Weather and time permitting, I’m going to spray every five days for two or three weeks, varying the insecticide, and lacing it with sugar (Esther Geldenhuys’ tip, which is echoed in some web pages) to try to lure the insects out of their hidey holes. As thrips don’t feed until they reach the pupal stage, it’s possible that I have in the past wiped out successive generations of the creatures, only to have them continuously replaced by the next generation in line – which might be the explanation for my thinking that all of my spraying was having no effect. I’ll keep you posted about whether or not this succeeds. Meanwhile, why don’t you try the trick with the sheet of paper? You might be surprised by what you see!